"To encourage profit and opportunity for America&apos;s pork industry." Premium Pork focuses on win-win relationships with producers and processors that are mutually beneficial. Producers Livestock has been helping farm families make money, access credit and protect their pork profits for over 80 years. 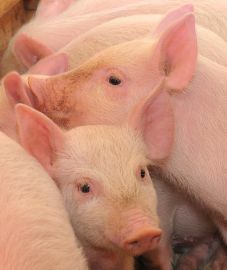 Whether you&apos;re a U.S. producer who wants to hedge hogs without margin calls, or wants a simple butcher hog marketing service that keeps you in the top end of the available market year-in and year-out, or you&apos;re a Canadian ISO producer or off-site investor looking for someone to enable you to finish your pigs in Iowa with contract finishing assistance and complete marketing, financing and price risk management services; or perhaps you&apos;re a packer looking to off-load your producer forward contracting program and still get the hogs: we&apos;re the association for you. Premium Pork® is a Service of Producers Livestock Marketing Association. Financing is offered through Producers Livestock Credit Corporation, a wholly owned subsidiary. Commodities trading is offered through Producers Commodities LLC., a wholly owned subsidiary. Producers is headquartered in Omaha, Nebraska with Pork Agent Offices in Sioux City (western Iowa) and Harper (eastern Iowa). Producers Livestock: providing Buyer-Seller Marketing Services, Commodities Trading and Risk Management Programs, with Basic and Sophisticated Credit Products, for over 80 Years. Please enjoy our website, and our services!